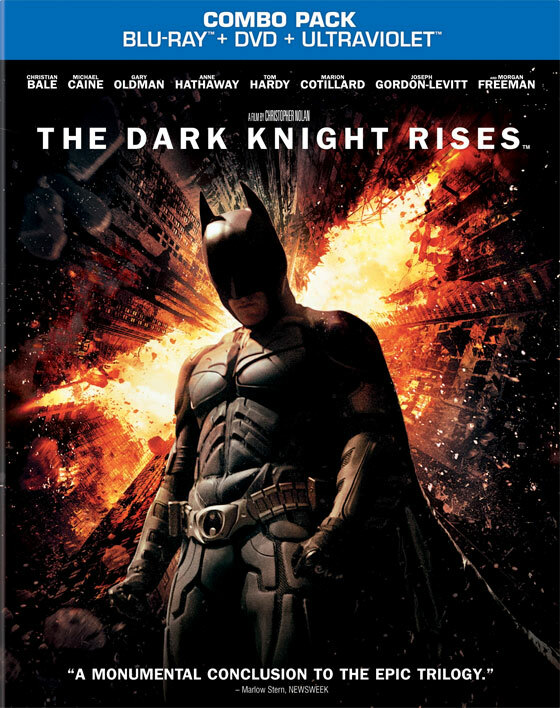 On December 4th, the epic conclusion of Christopher Nolan‘s Dark Knight trilogy hits store shelves. 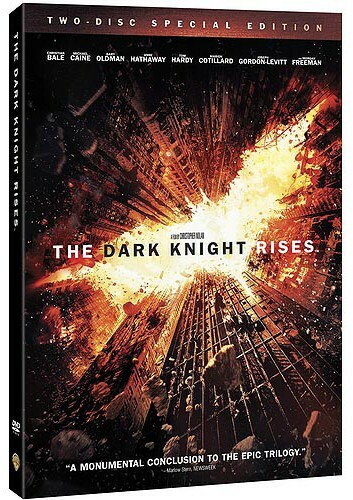 If you’re a hard-core fan like me, or looking for a great Christmas gift, The Dark Knight Rises is a must have. If for some reason you still haven’t seen The Dark Knight Rises (and why haven’t you?! ), check out TJ’s review of the film here. Then come back and figure out which version of the DVD/Blu-ray is best for you. The Batmobile: An hour long documentary on the history of the Caped Crusader’s automobile. Trailer Archive: Containing four trailers for the film. Print Campaign Art Gallery: Contains 31 pieces of advertising for the film that you may or may not have seen. High-Altitude Hijacking: The making of the plane crash in the beginning of the film. Return to the Batcave: See what went in to building the Batcave for the final film including a time lapse of its creation. Beneath Gotham: Inside the making of Bane’s lair. Concept art and the creation of Batman’s jet, the Bat. Batman vs Bane: What went into the primary fight scene between the Dark Knight and the mercenary. Armory Accepted: How Bane’s men broke into Applied Sciences to steal Batman’s arsenal of weapons. Game Day Destruction: How the production team blew up the football field and made the stadium appear filled. Demolishing a City Street: How the crew blew up a Gotham street when Joseph Gordon-Levitt’s character John Blake drove down it. The Pit: What went into designing the hole where Bruce Wayne was trapped, located in India. The Chant: How director Christopher Nolan’s team came up with the repeated words that became the inspiration for Bane’s score. The War on Wall Street: How Nolan brought the massive fight in front of the New York Stock Exchange to life with 1,100 people. Race to the Reactor: How the crew made the chase scenes between the Batpod, Tumbler, and the trucks. Shadows & Light In Large Format: Nolan and the crew sound off on the challenge of shooting the film largely in IMAX. The End of a Legend: Nolan, Christian Bale, and the team open up on completing the Dark Knight trilogy. For the Batman fan on your Christmas list, nothing would make a better gift than The Dark Knight Rises Limited Edition Bat Cowl with Blu-ray Combo Pack (includes DVD and Digital Copy), which will be individually numbered and limited to 35,000. This gift set will be available at all major retailers. Also coming to DVD and Blu-ray on December 4th is The Dark Knight Trilogy. This limited edition gift set includes Batman Begins, The Dark Knight, and The Dark Knight Rises all in one pack, and will be sold in all major retail locations. In addition to offering the basic versions, select retailers have versions exclusive to the stores and may be available in limited quantities. Each exclusive version also contains the film and features listed above, but also come with collectible items or extra bonus content. While Walmart’s The Dark Knight Rises Blu-ray is the same version offered at other retail locations, Walmart is the only place that I’ve seen offer a 2-Disc Special Edition DVD. There aren’t any details on the bonus features included on the DVD, but I’m assuming it’s some of the same ones on the Blu-ray. Also, if you pre-purchase The Dark Knight Trilogy Limited Edition Blu-ray Gift Set in store you can instantly watch an UltraViolet digital version of Batman Begins and The Dark Knight on VUDU and watch The Dark Knight Rises on December 4th. Click the links to order your own copy of Walmart’s 2-Disc Special Edition DVD or Trilogy. 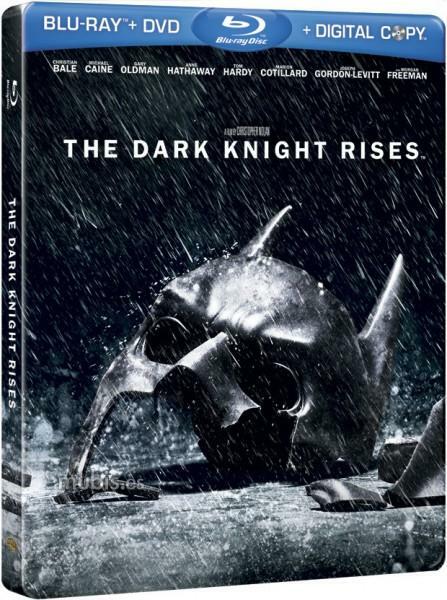 The Dark Knight Rises Blu-ray Digibook Combo Pack contains Blu-ray, DVD, and Ultraviolet digital copy with original 25-page comic depicting the prologue from the film plus 7 pages of filmmaker concept art. Each copy includes exclusive lenticular lens cover designed to showcase images of Batman vs. Bane when held from different angles. 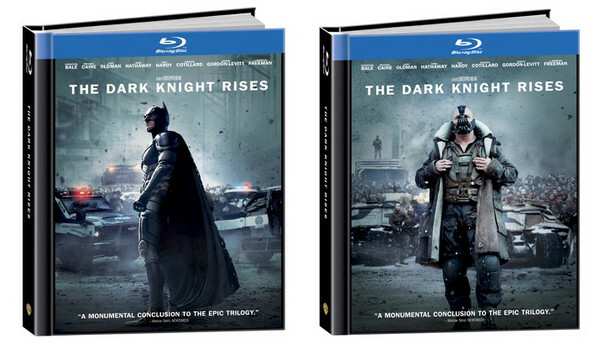 The Dark Knight Rises Blu-ray Combo Pack SteelBook comes with the Blu-ray, DVD, and UltraViolet digital copy, plus The Dark Knight Reborn documentary and exclusive SteelBook packaging. The documentary is 35 minutes long and features behind the scenes footage of The Dark Knight trilogy. If you pre-order now, you can get The Dark Knight Reborn documentary download early in HD via CinemaNow. 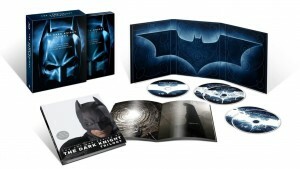 Click the link to get your copy of Best Buy’s The Dark Knight Rises combo pack. In my opinion, the version you should buy depends on the content that you want. It looks like the only version that will be offering any extra content is Best Buy’s combo pack. If you want cool collectibles, all retail locations will be carrying the Limited Edition Bat Cowl. I’m leaning more towards the basic Blu-ray sold everywhere. That version already has over 3 hours of features and is well within my price range. But if I happen to be in a Best Buy on the 4th, I may end up changing my mind. Check back when the Blu-ray hits the shelves for my review of the bonus features. Is Best Buy’s “Dark Knight Reborn” documentary on disc, or does the set just come with a code for a download? I really only want it on disc. 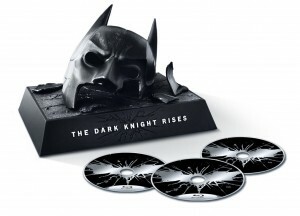 “Dark Knight Reborn” is included on the “Special Features” disc. I wish I could have bought the Bat-cowl release, but unfortunately I can’t afford to buy it right now due to how expensive new blu-rays can be. I was told by co-workers at DISH that it was released last Tuesday, and I can’t believe I didn’t know that already! I’m a huge Batman fan, so I added it to my Blockbuster@Home queue. But by adding it to my queue doesn’t cost me anything extra. In the meantime I’ll probably stream a few movies to my TV until it arrives in my mailbox, because Blockbuster allows me to do that too.